Create a statement in your garden with this aged, crackle-effect planter. 1 x 30cm (12in) Plastic Planter. Create a statement in your garden with this great value, aged-effect planter. 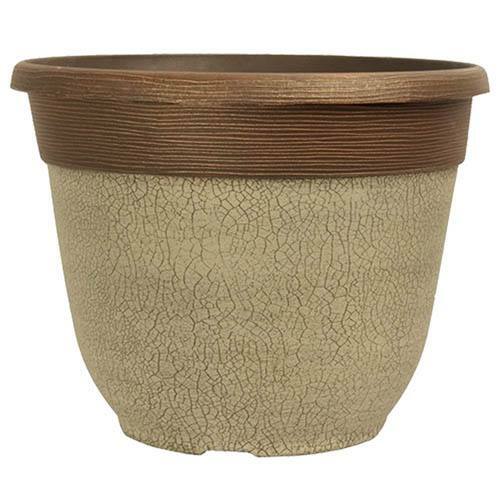 Perfect for bulbs, bedding, shrubs, houseplants and more, this stunning ceramic-looking pot will add an exquisite decorative look to your home or garden, without the cost of real pottery. An elegant and stylish pair of pots, it also makes a great contemporary feature and is a great investment - it'll really help to show off your precious specimen plants. Hand finished in white and copper paint, using a brand-new technique, it will add a touch of class to your home or garden with its antiqued, crackle-effect finish and copper-painted rim. We supply 1 x 30cm (12in) diameter plastic planter with a stylish, aged-white crackle finish - it will certainly help to provide spectacular garden displays for years to come! Height: 24cm (9.5in), Diameter: 30cm (12in), Volume 11L approx. Made from a durable UV stable plastic, and hand painted with a crackled, ceramic white effect.